He was elected President on 23 August 1982 unopposed, for a term set to begin on 23 September 1982 and end on 22 September 1988, but never took office as he was assassinated on 14 September 1982. Bachir Gemayel (Arabic: بشير الجميّل‎ Bashīr al-Jimayyel, also romanized al-Jumayyil and El Gemaiel, Arabic pronunciation: [baˈʃiːr ʤɪ'ma.jjɪl]; 10 November 1947 – 14 September 1982), also Bashir Gemayel was a senior member of the right-wing Christian Phalange party and the founder and supreme commander of the Lebanese Forces militia during the early years of the Lebanese Civil War (1975–90). He was the youngest president-elect and one of the most controversial figures in Lebanese history. He was elected president on 23 August 1982 while the country was torn by civil war and occupied by both Israel and Syria. He was assassinated on 14 September 1982, along with 26 others, when a bomb exploded in Beirut Phalange headquarters. While some have accused Habib Tanious Shartouni, the US Federal Bureau of Investigation blamed the Syrian Social Nationalist Party (SSNP). Bachir was born in the Achrafieh neighborhood of Beirut on 10 November 1947, the youngest of six children. The Gemayel family originated from Bikfaya village in the Matn District of Lebanon and is one of the most influential Christian families in the country. His father was Pierre Gemayel, who founded the Phalange party in 1936 as a youth movement. Bachir Gemayel attended the Jesuit Collège Notre Dame de Jamhour and the Institution Moderne du Liban (IML)- Fanar. He completed his university education at St. Joseph University (Université Saint-Joseph - USJ) in Beirut. After teaching for three years at the Lebanese Modern Institute, he graduated in 1971 with a bachelor's degree in law and another in political sciences in 1973. In 1971, Gemayel studied at The Center for American and International Law near Dallas, Texas in the United States. Qualifying in 1972, he joined the bar association and opened an office in Hamra Street, West Beirut. Bashir's father Pierre Gemayel studied pharmacology in Europe and founded the Phalange Party in 1936 (also known as Kataeb) upon his return to Lebanon, modelling the party after the Spanish and Italian Fascist parties he had observed there. It swelled to 40,000 members. Although he became a Lebanese minister, and was targeted in at least two assassination attempts, Pierre Gemayel never rose to the prominence of his sons but remained a powerful figure until his death in 1984. A month after Bashir's death, his brother Amine Gemayel was elected president in 1982, remaining in office until the end of his constitutional second term in 1988. Many of Bashir's other family members would go on to be elected into the Lebanese parliament: His widow Solange Gemayel (in 2005), his son Nadim Gemayel (in 2009 and 2018), his nephews Sami Gemayel (in 2009 and 2018) and Pierre Amine Gemayel (in 2000 and 2005) who also served as the Minister of Industry in 2005 until his assassination on 21 November 2006. Bachir became a member of the Kataeb Party's youth section when he was 12 years old. Bachir realized the dangers that surrounded Lebanon in 1958, so he spent a lot of time with the organized political wing of the Kataeb Party. He attended the meetings organized by the Kataeb Student Section, and he was the president of the Kataeb Circle in St. Joseph University between 1965 and 1971. In the late 1960s, he underwent paramilitary training in Bikfaya, and he was appointed squad leader of a militia unit of the Kataeb Regulatory Forces - KRF (the Party's military wing formed in 1961). Then in the early 1970s, he formed the "Bikfaya Squad" within the RKF, where he became acquainted with the basics of military combat. In 1968, he participated in a student colloquium organized by the newspaper Orient, following events which occurred across Lebanese universities between the Muslim and leftist Pan-Arabist students supporting the Palestinians in Lebanon on one side, and Lebanese Christian nationalist (Phoenicist) students (whom Bachir represented) on the other. After the 1968-69 clashes between the Lebanese Army and the PLO, Bachir gathered a group of Christian students, and started training them in the Kataeb-run Tabrieh training camp, located near Bsharri in the Keserwan District mountains. This was the start of what would later become the Lebanese Forces. At this stage, he was a junior militia commander under the orders of William Hawi, the founder and head of the KRF. Bachir with his Father Pierre. Bachir with Kataeb Regulatory Forces militiamen. In 1970, Bachir was briefly kidnapped by Palestinian militants in Lebanon and taken to the Tel al-Zaatar refugee camp. He was released 8 hours later. Bachir became a member of the "BG Squad" formed by William Hawi. He was a revolutionary in the party. He became close with Jean Nader, the leader of Achrafieh at that time, and became the vice president of that Lebanese Capital district, a position that he held from 1971 until 1975. Bachir became the head of the "BG Squad" after its members found him as a leader more close to their views. This group was formed of 12 specially trained members such as Fouad Abou Nader, Fadi Frem, Elie Hobeika and others. They were fierce fighters, and they were known for their violent performance in the field. This group was out of the direct control of the party. He had his own views and principles, and he wanted to run for the Vice Presidency of the party, but his men said to him that they wanted him as the leader of the "Lebanese Forces" and not the VP of a party. In addition, many members of the party did not want him as the VP because he was the son of Pierre Gemayel, the founder and president of the party. The elections were cancelled and did not take place until after his assassination. Bachir submitted his resignation from the party in 1976, but it was rejected. This was because the Kataeb Party was forced to approve the entrance of the Syrian Army to Lebanon to put an end to the war, but Bachir refused to accept this, being strongly against the Syrian intervention because he believed that Syria wanted to annex Lebanon. He came to this conclusion because the Syrian officials repeatedly stated that Lebanon is part of Syria and that the Syrian Army doesn't need anyone's permission to enter Lebanon. Moreover, at that time, the Syrian educational system was teaching that Lebanon was a Syrian district. In 1975, Gemayel was accused by the LNM of being responsible for the Black Saturday massacre of Palestinians and Lebanese Muslims. According to Phalange member Karim Pakradouni, Bachir admitted to him that while being in an emotional state for the killing of four Phalangists earlier that day, he ordered his militiamen into the streets. Bachir added that when the situation developed into something he did not agree with and civilians were being killed, he tried to stop the killings but failed to. However, according to Michel Samaha, another Phalange member, Bachir was outside Beirut, arriving after the killing of civilians had started. Michel Samaha added that Bachir was one of the many senior members of the Phalange Party who tried to stop this massacre. Christian East Beirut was ringed by heavily fortified Palestinian camps from which kidnappings and sniping against Lebanese civilians became a daily routine. Christian East Beirut became besieged by the PLO camps, with severe shortages of food and fuel. This unbearable situation led the Kataeb Forces and their allied Christian militias to besiege the Palestinian camps embedded in Christian East Beirut one at a time and bring them down. On January 18, 1976, Bachir led the invasion of the heavily fortified Karantina camp that was located near the strategic Beirut Harbor: About 1,000 PLO fighters and civilians were killed. The Palestinian PLO and as-Saiqa forces retaliated by attacking the isolated defenseless Christian town of Damour about 20 miles south of Beirut on the coast, during the Damour massacre in which 1,000 Christian civilians were killed and 5,000 were sent fleeing north by boat, since all roads were blocked off. The Maronites retaliated with the invasion of the Tel al-Zaatar camp that same year (The camp was placed under siege for 52 days by the Tigers militia led by Dany Chamoun). Bachir played an important role in the last stages of the battle: he sent a group of his forces that moved through the sewers and they blew up the ammunition storage in the camp. This incident was considered to be the lethal blow that led the fall of the camp. The Christian militias also fought against the PLO and LNM militias at the Battle of the Hotels in central Beirut. Bachir led the battle for the Holiday Inn that had an important strategic location. The battle was a success for Bachir's troops, and they were able to move the PLO out of the hotel. After ensuring the safety of the rear lines and their effectiveness (necessary for the safety of Christian East Beirut), Bachir and his troops decided to abandon the hotel. In 1976, with the death of William Hawi, killed by a sniper during the battle of Tall Al-Zaatar, Bachir became head of the Kataeb Regulatory Forces militia. Later that year, he became a leading member of the Lebanese Front, a coalition of several Christian parties, and commander of their military wing, the Lebanese Forces. A military coalition of several Christian militias which not only opposed the PLO but also the Syrian Army presence, who had entered Lebanon at first to assist in defeating Palestinian militants, before turning into occupiers. Bachir led his troops in the infamous “Hundred Days War” in Lebanon in 1978, in which the Lebanese Forces successfully resisted the Syrian shelling and attacking of Eastern Beirut for about three months before an Arab-brokered agreement forced the Syrians to end the siege. Syrians took high buildings such as Burj Rizk Achrafieh and Burj El Murr using snipers and heavy weapons against civilians. The soldiers stayed for 90 days. Another major clash took place near the Sodeco area in Achrafieh where the Lebanese Forces fought ferociously and led the Syrian army out of the Rizk Building. This War led to the withdrawal of the Syrian troops from East Beirut and the free Christian Areas. At this time, Israel was the primary backer of the Lebanese Front's militia. Despite its increasing success in its battles against the PLO and the Syrian troops two factors led to the eventual demise of the Lebanese Front. In 1980, in order to stop the clashes happening inside the Christian areas, between the Kataeb Militia and the Tigers Militia, and in order to eliminate the possibility of an Intra-Christian war, Bachir sent his troops to the town of Safra, where Dany Chamoun and members of his Tigers Militia were vacationing. The Tigers under the control of Elias el Hannache were exterminated in what was later named Safra massacre. Dany's life was spared and he sought refuge in West Beirut, but Camille Chamoun's support of the attack was interpreted as him believing that his son's militia was getting too out of control. Israel invaded Lebanon in 1982. Defense Minister of Israel, Ariel Sharon, met with Bachir months earlier, telling him that the Israeli Defense Force were planning an invasion to uproot the PLO threat to Israel and to move them out of Lebanon. While Bachir did not control Israel's actions in Lebanon, the support Israel gave the Lebanese Forces, militarily and politically, angered many Lebanese leftists. Bachir met with Hani Al Hassan (representative of the PLO) and told him that Israel would enter and wipe them out. Bachir told him to leave Lebanon peacefully before it was too late. Hani left and no reply was given to Bachir. Israel invaded and the PLO were expelled from Lebanon in August 1982. During the invasion, the Israelis wanted the Lebanese Forces to assist the Israeli Army militarily by fighting the PLO and allied groups in West Beirut; however, Bachir refused that because he said that his forces would not assist an invading army. By now, Bachir had announced his candidacy for president. He was backed by the United States, who sent peacekeeping troops to oversee the withdrawal of the PLO from Lebanon. Bachir had requested that they stay longer to keep Lebanon stable until he could reunite it, but his request was denied. The Mossad also contributed to his presidency. On 23 August 1982, being the only one to declare his bid, Bachir was elected president, as he prevailed over the National Movement. On 1 September 1982, two weeks before his assassination and only one week after his election, Bachir met the Israeli Prime minister Menachem Begin in Nahariya. During the meeting, Begin demanded that Bachir sign a peace treaty with Israel as soon as he took office in return of Israel's earlier support of Lebanese Forces and he also told Bachir that the IDF would stay in South Lebanon if the Peace Treaty wasn't signed. Bachir was furious at Begin and told him that the Lebanese Forces didn't fight for seven years and that they didn't sacrifice thousands of soldiers to free Lebanon from the Syrian Army and the PLO so that Israel can take their place. Bachir also added that he will not sign the Peace Treaty without national consensus on the matter. Begin was reportedly angry at Bachir for his public denial of Israel's support. Bachir refused signing a peace treaty arguing that time is needed to reach consensus with Lebanese Muslims and the Arab nations. This angered the Israelis because they knew that it is almost impossible for the Lebanese Muslims to agree on a Peace Treaty. They realized that Bachir was starting to distance himself from them. On 12 September 1982, in an attempt to fix the relations between Begin and Bachir, Ariel Sharon had a secret meeting with Bachir in Bikfaya. During the meeting, Bachir told Sharon that the Lebanese Army would soon enter into the Palestinian Camps to disarm any remaining fighters. They also agreed that the Lebanese Army would attack the Syrian Army's positions in Lebanon assisted by the Israeli Army. In addition, Sharon tried to convince Bachir about signing a Peace Treaty, but Bachir did not change his position on this matter. Bachir had planned to use the IDF to push the Syrian Army out of Lebanon and then use his relations with the Americans to pressure the Israelis into withdrawing from Lebanese territory. 11 September : Beirut's economic market resumes its activities; Bachir meets with former Lebanese Prime Minister Saeb Salam. During these 21 days, fighters from the Lebanese Forces were prohibited from wearing their army clothes and also from carrying their weapons in the streets. The Lebanese Army was the only armed force in the streets. On 14 September 1982, Bachir was addressing fellow Phalangists at their headquarters in Achrafieh for the last time as their leader and for the last time as commander of the Lebanese Forces. At 4:10 PM, a bomb was detonated at the headquarters, killing Bachir and 26 other Phalange politicians. Whereas rumors spread that Bachir had gotten out alive, it was confirmed the next morning by the Lebanese Prime Minister Shafik Wazzan that Bachir was indeed assassinated. Habib Shartouni, a member of the Syrian Social Nationalist Party and also a Maronite Christian, was later arrested for the assassination. His sister was living in the apartment above the room Bachir was in. He had visited her the previous day and planted the bomb in her apartment. The next day, he called her and told her to get out of the building. Once she was out, he detonated the bomb from a few miles away from the building. When he came back to check on his sister, he was immediately arrested. He later confessed to it, saying he had done this because “Bachir had sold the country to Israel.” A reporter was heard telling him "You didn't kill a man, you killed a country." He was imprisoned for 8 years, until Syrian troops took over Lebanon at the end of the war and freed him on 13 October 1990. Amine Gemayel did not condemn Habib Shartouni because of immense Syrian pressure. Many point fingers at the Syrian government and then-Syrian President Hafez al-Assad for having knowledge of the assassination attempt and for backing Shartouni. Condemnations poured in from around the world, including from the United Nations Security Council in Resolution 520 as well as from American President Ronald Reagan. Reagan had been one of Bachir's most staunch supporters, saying "this promising young leader had brought the light of hope to Lebanon." Bachir Gemayel's older brother Amine Gemayel was then elected as president, serving from 1982 to 1988. Rather different in temperament, Amine Gemayel was widely regarded as more moderate than his brother. Many of Bachir's followers were dissatisfied with Amine. Eventually, the Lebanese Forces became independent from the Phalange and its own political party. The Sabra and Shatila massacre was the killing of between 762 and 3,500 civilians, mostly Palestinians and Lebanese Shiites, by a militia close to the Kataeb Party, also called Phalange, a predominantly Christian Lebanese right-wing party in the Sabra neighborhood and the adjacent Shatila refugee camp in Beirut, Lebanon. The massacre was presented as retaliation for the assassination of newly elected Lebanese president Bachir Gemayel, the leader of the Lebanese Kataeb Party. Throughout the postwar period, the cult of Bashir Gemayel was the most visible commemorative phenomenon in parts of Beirut especially Ashrafieh. The leader of LF, is revered with a wealth of different signs, ranging from spray-painted profiles and posters in the public space of the entry hall of Beirut's old Jesuit university, University Saint-Joseph. Bachir Gemayel's widow, Solange Gemayel, works to keep his legacy alive through the Bachir Gemayel Foundation, a political and informational organization. Bachir's eldest daughter, Maya, was murdered on 23 February 1980 at 18 months of age by a car bomb intended for her father. He had two surviving children: His second daughter, Youmna, was born later in the year and received her degree in political science in Paris. She is now working towards her Masters in Management at ESA (École supérieure des affaires) in Beirut. Gemayel's son, Nadim, who was born a few months before Bachir was killed, was a law student and political activist, and was elected as a member of the Lebanese Parliament in 2009. The relations between Lebanon and the United States had a high priority rating on Gemayel's agenda, and occupied a sizeable portion of his time and efforts. Bachir Gemayel believed that the U.S. and Lebanon are natural allies since they enjoy a common cultural affinity, similar ideological beliefs, free economic systems and strong commitment to human rights and dignity. He believed in the U.S. leadership of the Free World and he was confident that Washington would strengthen its ties to Lebanon. the Lebanese people, he declared, do not wish that their American friends fight their battle and suffer casualties. However, they look to the U.S. for economic and military aid so that they themselves may free their country. The relations between Lebanon and the European countries deteriorated because Gemayel saw the latter trying to solve the Middle-East problem at the expense of Lebanon. In addition to this factor, many European countries had adopted the obsequious policy of fawning on the Arab States in order to secure their oil supplies. Gemayel firmly believed that Lebanon has a great role to play in emancipation of the Arab world but that Lebanon must be respected and trusted as an equal and be free of foreign intervention (including Arab intervention) and that Arab governments must understand that Lebanon is a sovereign state and has right to reject any policy contrary to its national interests. He warned the Arab world not to exploit the friendship and cooperation of the Lebanese people by attempting to settle Middle East conflicts at Lebanon's expense. He acknowledged, however, that during his visit to Ta'if, he was advised by his Saudi hosts that they understand Lebanon's problems and position on the PLO and Syria. Saudi leaders publicly lauded him for his leadership and vision. Gemayel insisted in his talks that the PLO and Syrian armed presence in Lebanon is not negotiable or open for compromise since it undermines Lebanon's sovereignty which cannot be divided among non-Lebanese armies. He also praised the efforts deployed by Saudi Arabia and Kuwait in helping Lebanon, and he called for stronger relations with these two countries. "The Lebanese people," he declared, "will reserve a special friendship for the Saudis and their Arab friends." Bashir defined his attitude towards Israel clearly: "This is our answer with regard to our relations or our dealings with Israel: We are nobody's agents or lackeys, we are Lebanese. As for the Israeli arms present in the country, this can be explained by the fact that some villages might have felt themselves threatened, and were cornered into getting supplies from anywhere that might be convenient including Israel. When a person feels threatened by danger, he will accept help from the devil. A very critical situation would develop if we were forced to turn towards Israel for help." As for his attachment to the South of Lebanon, Bashir expressed this by appealing to all "to work for the preservation of the Lebanese identity in the South. This can best be done by a State initiative to provide them this neglected region with the basic social services, education, and development, all of which are sorely lacking, and to ask the State to restore its full sovereignty over the South, in all its forms." Concerning the Syrian-Palestinian-Israeli conflict on the battlefields of Lebanon, it was obvious that the three belligerents were fighting to impose the solution that would best serve their interests, exploiting the Lebanese situation in the process. Whereas what Bashir was concerned with, first and foremost, was to find solutions that would enable the Lebanese to recover their land and save the people from their present tribulations. In this connection he said: "It is now a matter of competition, a race between Syrian moves, Palestinian moves and Israeli action, and the one who wins the race will be able to solve the Lebanese problem radically. As for us, we have taken a decision: we want to recover our territorial integrity, our national sovereignty and the freedom of our people." Al-Ashbal: its first camp was organized under the patronage of Bashir in Jbeil scout camping grounds (1975). Popular Committees: launched by Bashir in 1976, their aim is the people's participation in the organization of daily life. Radio Free Lebanon : founded by Bashir in 1978 to explain to the world the reality of the Lebanese cause. Radio 102 : out of Bashir's desire for a commercial station in order to alleviate the burden of the war (1979). Delta Computer : founded in 1979 as a specialized information body related to all components of social organization. Help Lebanon : founded to take care of children and alleviate the consequences of the war. Lebanese Broadcasting Corporation (LBC) : launched in 1980 as a national, educational, cultural and non-commercial television. Gamma Group : an institution including specialists to plan the building of a modern state in all of its sectors (1982). The Lebanese Cultural Association : created in 1982 to deal with intellectual, literature and artistic affairs as well as Lebanese civilization. Achrafieh Merchants Committee : created in 1982 to revive the economy and trade and organize the market. Achrafieh Festival Committee : created in 1982 to organize fairs and exhibitions and to encourage artistic activities. ^ Reuters (10 March 1982). "Phalangists identify bomber of Gemayel as Lebanese leftist". The New York Times. ^ Neil A. Lewis (18 May 1988). "U.S. Links Men in Bomb Case To Lebanon Terrorist Group". The New York Times. ^ "Bashir Gemayel (1947-1982)". Bachir Gemayel. Retrieved 4 July 2012. ^ a b c d e f g h i Hayek, Georges (2010). History in a Man – Bachir Gemayel. p. 68. ^ Harris (p. 162) notes "the massacre of 1,500 Palestinians, Shi'is, and others in Karantina and Maslakh, and the revenge killings of hundreds of Christians in Damur"
^ "Historical Fact: The Massacre and Destruction of Damour". Lebanese Forces. Archived from the original on 9 June 2012. Retrieved 4 July 2012. ^ "The Battle of Tel el Zaatar 1976". Liberty 05. Retrieved 4 July 2012. ^ "Lebanon: Beirut's Agony Under the Guns of March". Time. 5 April 1976. ^ "Historical Fact: The Battle of Zahle - 1981". Lebanese Forces. Archived from the original on 26 June 2012. Retrieved 4 July 2012. ^ a b Bsisu, N. (2012). "Israeli Domestic Politics and the War in Lebanon" (PDF). Lights: The MESSA Journal. 29. Retrieved 23 March 2013. ^ "Israel and Lebanon - Allies - Part 2". YouTube. 20 August 2007. Retrieved 30 December 2012. ^ Hayek, Georges (2010). Bachir Gemayel - History in a Man. self-published. p. 278. ^ Avon, Dominique; Khatchadourian, Anaïs-Trissa; Todd, Jane Marie (10 September 2012). Hezbollah: A History of the "Party of God". Harvard University Press. ISBN 9780674067523. ^ Khalife, Nabil (2008). Lebanon in Kissinger's Plan. Byblos Center for Research. p. 271. ^ "Bachir Gemayel Community Site - Who is Habib El-Shartouni ?". Bachirgemayel.org. Retrieved 30 December 2012. ^ "Wars of Lebanon - People". Wars.meskawi.nl. Retrieved 30 December 2012. ^ "Beirut Bomb Kills 8; Christian Militia Chief Believed to Be Target; Fought Palestinians and Leftists". The New York Times. 24 February 1980. p. 10. ^ "Syrian chronicles 1973-1990". Tayyar. Archived from the original on 19 December 2011. Retrieved 11 April 2013. "Words from Bashir: Understanding the Mind of Lebanese Forces Founder Bashir Gemayel from His Speeches: Rani Geha: 9781442160743: Amazon.com: Books". Amazon.com. Retrieved 30 December 2012. Wikimedia Commons has media related to Bachir Pierre Gemayel. The Sabra and Shatila massacre was the killing of between 460 and 3,500 civilians, mostly Palestinians and Lebanese Shiites, by a militia close to the Kataeb Party, also called Phalange, a predominantly Christian Lebanese right-wing party in the Sabra neighborhood and the adjacent Shatila refugee camp in Beirut, Lebanon. From approximately 18:00 on 16 September to 08:00 on 18 September 1982, a widespread massacre was carried out by the militia under the eyes of their Israeli allies. The Phalanges, allies to the Israeli Defence Forces (IDF), were ordered by the IDF to clear out Palestine Liberation Organization (PLO) fighters from Sabra and Shatila, as part of the IDF maneuvering into West Beirut. The IDF received reports of some of the Phalanges atrocities in Sabra and Shatila but failed to stop them. The Lebanese Phalanges Party, better known in English as the Phalange, is a Christian Democratic political party in Lebanon. Despite being officially secular, it is supported mainly by Maronite Catholics. The party played a major role in the Lebanese Civil War (1975–90). In decline in the late 1980s and 1990s, the party slowly re-emerged in the early 2000s. It is now part of the March 14 Alliance. Elie Hobeika was a Lebanese Phalangist and Lebanese Forces commander during the Lebanese Civil War, and former MP. Hobeika gained notoriety when he was named by the Israelis as one of the commanders of militiamen responsible for the massacre in the Sabra and Shatila refugee camps on the outskirts of Beirut in 1982. The Lebanese Civil War was a multifaceted civil war in Lebanon, lasting from 1975 to 1990 and resulting in an estimated 120,000 fatalities. As of 2012, approximately 76,000 people remain displaced within Lebanon. There was also an exodus of almost one million people from Lebanon as a result of the war. Amine Pierre Gemayel is a Lebanese politician who was President of Lebanon from 1982 to 1988 and was the leader of Kataeb Party. Gemayel was elected to the presidency by the National Assembly on 21 September 1982, in place of his brother Bachir Gemayel who had been elected the previous month but had been assassinated before taking office. Dany Chamoun was a prominent Lebanese politician. A Maronite Christian, the younger son of former President Camille Chamoun and brother of Dory Chamoun, Chamoun was also a politician in his own right, and was known for his opposition to the occupation of Lebanese territory by foreign forces, whether Syrian or Israeli. The Guardians of the Cedars (GoC) are a far-right ultranationalist Lebanese party and former Christian militia in Lebanon. It was formed by Étienne Saqr and others along with the Lebanese Renewal Party in the early 1970s. It operated in the Lebanese Civil War under the slogan: Lebanon, at your service. Sheikh Pierre Gemayel was a Lebanese political leader. He is remembered as the founder of the Kataeb Party, as a parliamentary powerbroker, and as the father of Bachir Gemayel and Amine Gemayel, both of whom were elected to the Presidency of the Republic in his lifetime. He opposed the French Mandate over Lebanon in the late 1930s and early 1940s, and advocated an independent state, free from foreign control. He was known for his deft political maneuvering, which led him to take positions which were seen by supporters as pragmatic, but by opponents as contradictory, or even hypocritical. Although publicly sympathetic to the Palestinian cause, he later changed his position due to Palestinian support of the Lebanese National Movement and its calls to end the National Pact and establish non-sectarian democracy. The Karantina massacre took place early in the Lebanese Civil War on January 18, 1976. With the breakdown in authority of the Lebanese government the militancy of radical factions increased. Habib Tanious Shartouni is the convicted assassin of the Lebanese president Bachir Gemayel. William Amine Hawi, –, was a Lebanese-American businessman and a leader and militia commander of the Kataeb Party better known in English as the Phalange, a right-wing Christian political party in Lebanon. The Kataeb Regulatory Forces – KRF or RF, Forces Regulatoires du Kataeb (FRK) in French, were the military wing of the right-wing Lebanese Christian Kataeb Party, otherwise known as the 'Phalange', from 1961 to 1977. The Kataeb militia, which fought in the early years of the Lebanese Civil War, was the predecessor of the Lebanese Forces. 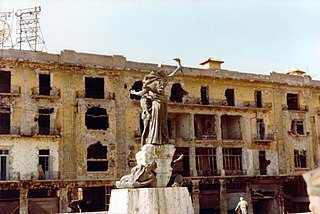 The Battle of the Hotels, also known as the "Hotel front", was a subconflict within the 1975–77 phase of the Lebanese Civil War which occurred in the Minet-el-Hosn hotel district of downtown Beirut. This area was one of the first fronts of the war that began in April 1975. The battle was fought for the possession of a small hotel complex, the St. Charles City Center, adjacent to the gilded Corniche seafront area on the Mediterranean, in the north-western corner of the downtown district of Beirut, and it quickly spread to other areas of central Beirut. The often fierce battles that ensued were fought with heavy exchanges of rocket and artillery fire from the various hotel rooftops and rooms. Sniper fire was commonly utilized. The Battle of Zahle took place during the Lebanese Civil War, between December 1980 and June 1981. During the seven-month period, the city of Zahle endured a handful of political and military setbacks. The opposing key players were on the one side, the Lebanese Forces or LF aided by Zahlawi townspeople, and on the other side, the Syrian Armed Forces, then part of the peace-keeping Arab Deterrent Force or ADF, aided by some Palestine Liberation Organization (PLO) factions. Demographically, Zahleh is one of the largest predominantly Christian towns in Lebanon. Adjacent to the town's outskirts, the Bekaa valley, spanning the length of the Syrian borders. Given Zahle's close proximity to the Bekaa Valley, the Syrian Armed Forces feared a potential alliance between Israel and the LF in Zahle. This potential alliance would not only threaten the Syrian military presence in the Bekaa valley, but was regarded as a national security threat from the Syrians' point of view, given the close proximity between Zahle and the Beirut-Damascus highway. Consequently, as a clamp-down strategy, the Syrian forces controlled the major roads leading in and out of the city and fortified the entire Valley. Around December 1980, tension increased between Zahlawi Lebanese Forces and Syrian-backed Leftist militants. From April to June 1981, throughout the four-month period, a handful of LF members, aided by Zahlawi Local Resistance, confronted the Syrian war machine and defended the city from Syrian intrusion and potential invasion. The Lebanese Forces – LF or Forces Libanaises (FL) in French, was one of the main Christian factions of the Lebanese Civil War. Originally an umbrella organization for different Christian parties, the Lebanese Forces later became a separate organization. It was mainly staffed by Maronite Christians.